All electrical components are pre-assembled and pre-wired in a compact control cabinet. Each system is tested and delivered ready-to-operate. 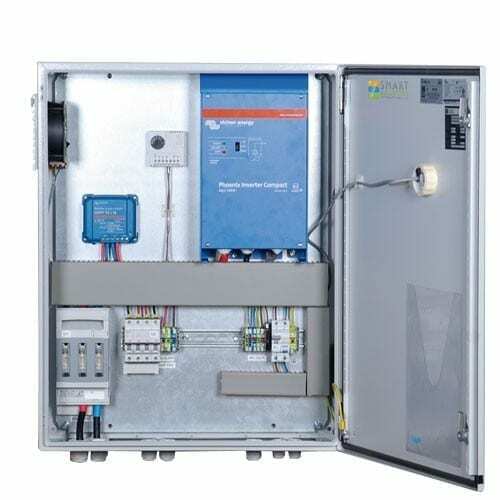 The Plug N Play Power System Smart Energy Phoenix Power Pro AC1200 guarantees a simple and error-free installation and commissioning on site. The Plug N Play Power System Smart Energy Phoenix Power Pro AC1200 cabinets are available for wall and/or ground installation. A thermally controlled fan system maintains a constant temperature inside the cabinet and ensures a long life of the electrical components. Core business of SMART ENERGY SYSTEMS INTERNATIONAL AG (SEI AG) is power supply from renewable energy sources. The technologies we apply use solar and wind energy and hydro-power as energy source. In addition to providing systems that are connected to the national grid, we install and supply turnkey off-grid systems. SEI AG operates worldwide. This is true for countries of the northern and southern hemisphere. Many of our systems, we have developed, are decidedly for use in emerging and developing countries. In the last 10 years we have implemented some 1,000 projects around the world. We take the advice, planning and implementation of individual projects. On the basis of our worldwide sales and service network, we deliver complete systems and components worldwide. Our headquarters is located in Karlsruhe, the northern edge of the Black Forest. In the tradition of German engineering work, we are involved in a wide network of strong technology partners. Join our ZERO Home Bills Community. The BEST Products from the BEST Brands at the BEST Retail Prices for ZERO Home Bills on ZEROhomebills.com by Solaranna.